Fragonard really loved to dream. His creative temperament is truly tremendous. Before us is a typical painting for a painter. In it you can feel the contradictions that miraculously coexisted in the works of the master. One gets the impression that the plot was dictated by aristocrats who love painting. We see the brilliance and feel the cheerful mood reigning in this work. But this does not deprive the scene of truth. It seems that the artist has become an unintentional witness to her. Guests gathered in the living room. The girl comes out just for a minute, since she forgot the scarf. The young man specifically lurked her. She finds himself in his hot arms. In all the pictured, movement and deep feeling are felt. Fragonard tries to convey all sorts of objects and pay maximum attention to their texture. The silk of the dress he prescribes in detail, truthfully and carefully. With the same skill depicted a scarf and a polished surface of the table. In all the strokes you can feel an incredible love for all sorts of manifestations of life. They are so juicy and colorful that the picture seems voluminous. It seems to the viewer that some more and the heroes of this light scene will come to life. Fragonard creates a picture in an unusual manner. The fact is that he wrote it in a late period. At this time classicism comes into fashion. He demanded the most accurate silhouettes and lines, as well as restraint in terms of color. Fragonar was alien to this style, but his influence can still be felt to some extent. 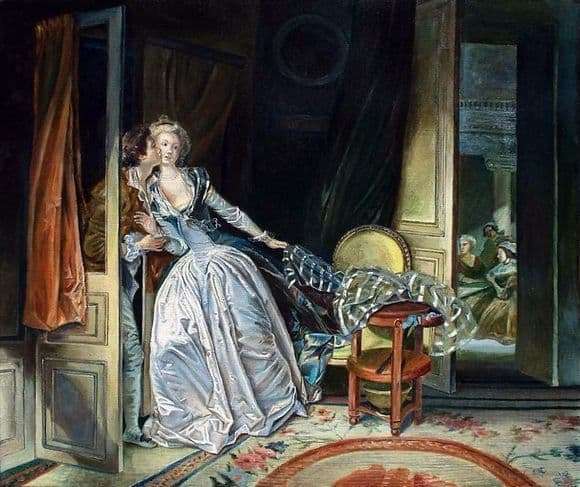 Fragonard was able to capture a fleeting kiss, which seemed to be stolen. Everyday scene has become a real masterpiece. The artist was able to convey his idea of ​​love. So masterfully conveyed by anything, the seemingly unremarkable scene acquires depth.